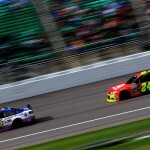 Jeff Gordon posted a 10th place finish at Kansas Speedway and moved to 7th in the NASCAR points standings, with a 7 point gap over the Chase cutoff line with one race remaining in Round 2. 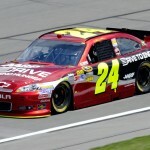 Gordon started 6th and struggled at the outset as he dropped to 11th by lap 7. He slipped to 12th by lap 20. The first caution waved on lap 29 for JJ Yeley’s crash. 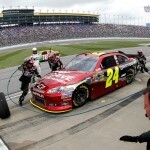 Pit stops followed with Gordon exiting in 15th place. Handling issues persisted as Gordon fell back to 19th by lap 55. On the next round of caution flag stops, chassis adjustments were made with Gordon restarting 25th on lap 70. He gained two spots over the next 20 laps to run 23rd on lap 90. Kyle Larson’s spin on lap 109 brought out the caution. Gordon had to make a second pit stop under the caution for loose lug nuts and restarted in 23rd place. 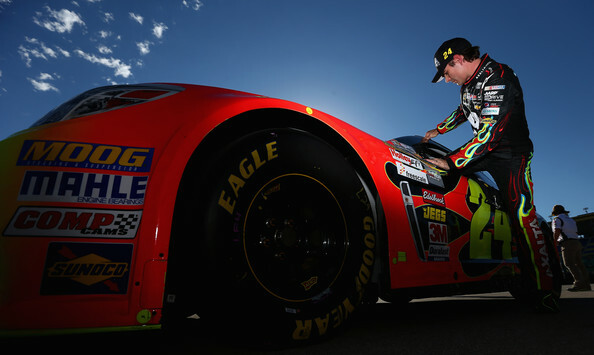 At the halfway point, Gordon re-entered the top-20. The next caution came on lap 155 for Austin Dillon’s cut tire. 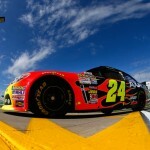 Gordon gained 4 spots on pit road and restarted in 16th place. 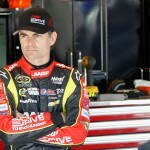 He entered the top-15 on lap 165 prior to a caution for Clint Bowyer’s crash. Gordon came to pit road for additional adjustments and restarted in 12th place. He moved to 11th with 80 to go when Brad Keselowski hit the wall. Gordon slipped back to 12th when Ryan Blaney passed a few laps later. Gordon came to pit road for a green flag stop with 49 to go and cycled through in 12th place. The next caution waved on lap 244 for Justin Allgaier’s wall contact. With just 12 cars on the lead lap at the time, Gordon came to pit road. He restarted in 12th with 19 laps to go. The next caution came with 4 laps to go when Joey Logano spun Matt Kenseth while battling for the lead. Gordon came to pit road for tires and restarted in 10th place for the green/white/checkered, and that’s where he came across the line to complete the event. 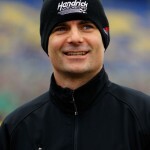 Jeff Gordon posted a 4th place finish at Kansas Speedway which surely was not indicative of how the night seemed to be playing out. Gordon battled handling issues for most of the night, and at one point was less than a second from going a lap down. 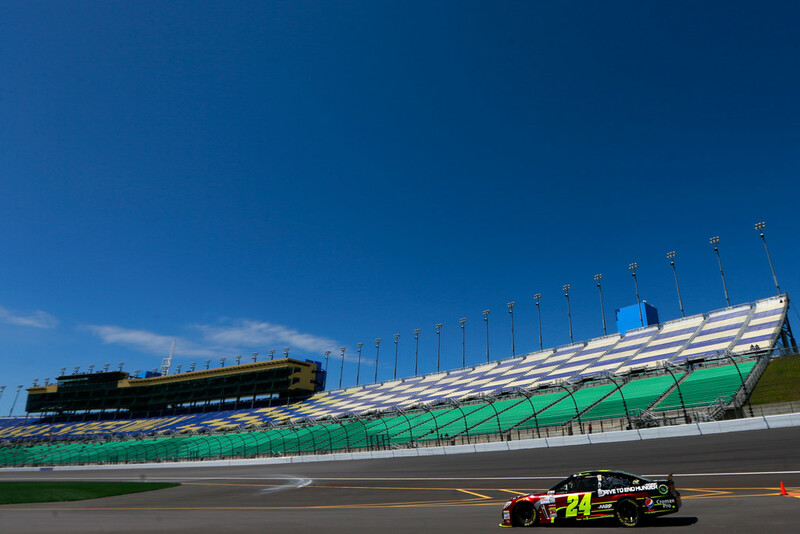 However, a well-timed caution flag kept him on the lead lap, and a late call to stay on the track during a caution period gave him the chance to post his 3rd top-5 in the last 4 races at Kansas. Gordon started 11th and slipped to 14th on the first lap before regrouping to take 11th on lap 3. The first caution waved on lap 4 for JJ Yeley’s spin. At the competition caution on lap 25, Gordon ran in 13th place. The crew changed 2 tires and Gordon restarted in 10th place. After dropping to 12th, he regrouped to enter the top-10 on lap 44. 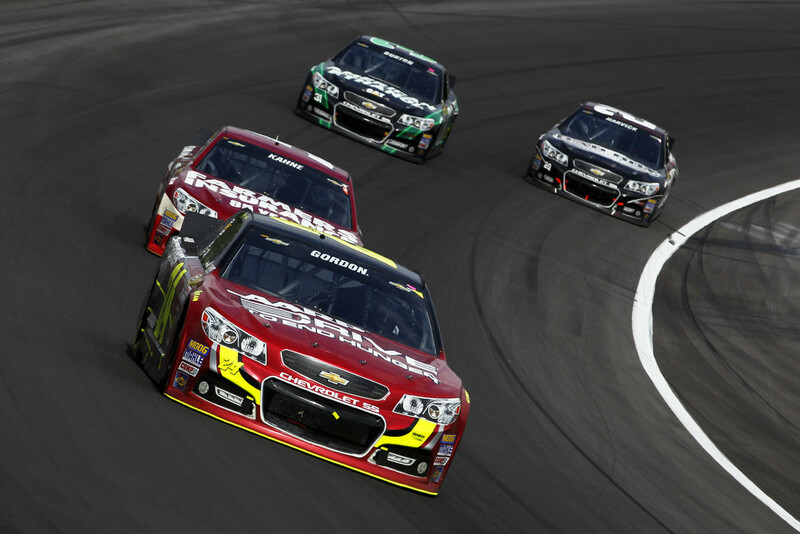 Gordon took a spot from Tony Stewart to move up to 8th, prior to Matt Kenseth passing to take 9th on lap 61. He battled handling issues and fell out of the top-10 on lap 70. Gordon came to pit road for a green flag stop on lap 80. 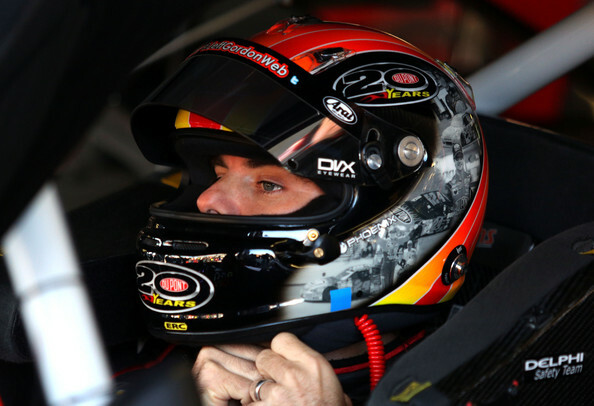 Following stops he ran in 14th place as race leader Martin Truex closed within a second to put him a lap down. 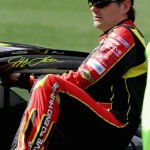 However, Jeb Burton’s spin on lap 93 brought out the caution to keep Gordon on the lead lap. Pit stops followed with Gordon gaining 4 spots to restart in 10th place. Rain began falling and the race was red-flagged shortly after 8:30pm/eastern. The race resumed after 11pm/eastern following rain and track drying. He ran between 7th-13th over the next 100 laps as the crew made adjustments during caution perods. With 79 to go, Gordon stayed out during a caution to move up to 4th for the restart. He took 3rd after the restart before a caution for Erik Jones’ wall contact with 71 to go. He closed in on Kyle Larson for 2nd place before a caution for Denny Hamlin’s cut tire with 60 to go. Pit stops followed with Gordon opting for two tires. However, a problem on the right front put him back in 11th place for the restart. Handling became an issue back in traffic as he fell to 13th with 45 to go. Gordon moved to 12th with 30 to go. He remained there until Ricky Stenhouse’s wall contact brought out a caution with 11 laps to go. Gordon stayed on the track and restarted in 4th place with 6 to go. 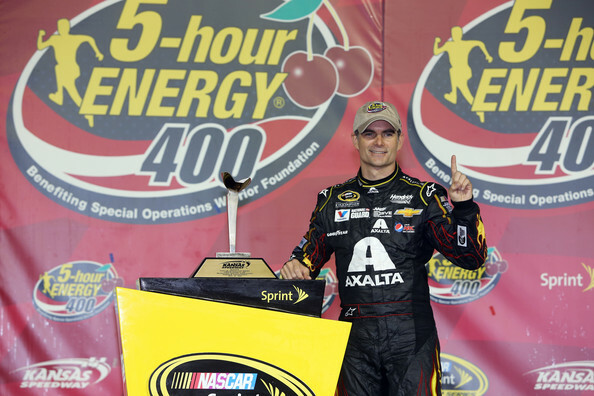 He held the spot and posted his 7th top-10 finish in the last 8 races. 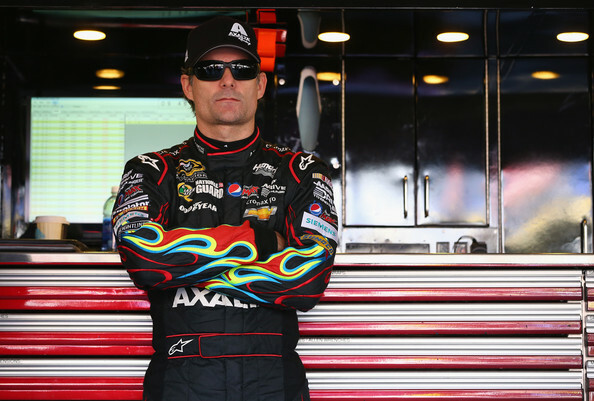 Jeff Gordon called his 14th place finish at Kansas Speedway a “survival day.” In many ways, that’s what it was. 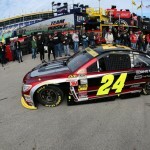 Gordon battled handling issues for most of the event while Chase contenders Jimmie Johnson, Brad Keselowski, and Dale Earnhardt Jr all posted sub-30th place finishes. 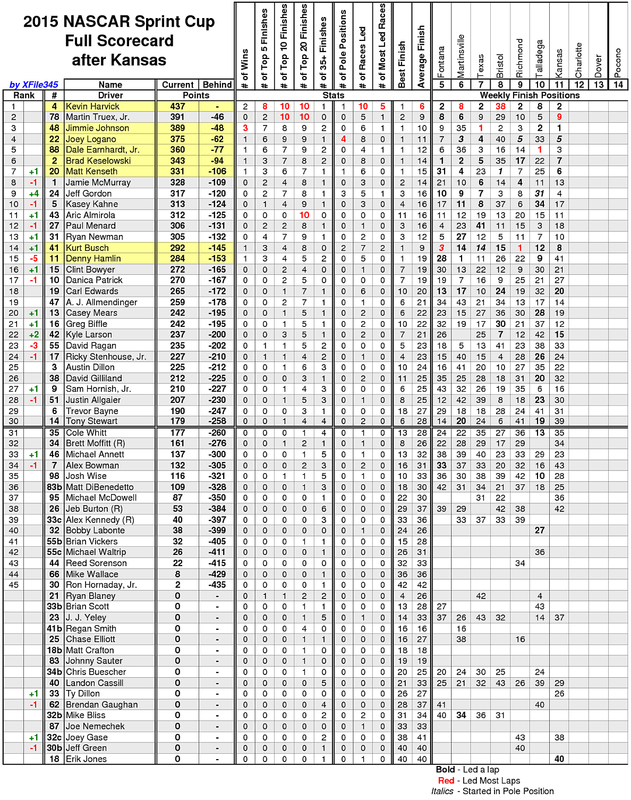 Gordon is tied for 7th in the NASCAR standings, and is 8 points ahead of the Chase round cutoff for the next round. Gordon started 5th and dropped to 6th on the inside line at the outset of the race. He slipped to 7th when Dale Earnhardt Jr passed on lap 10. Gordon battled a loose condition and dropped to 8th by lap 20. 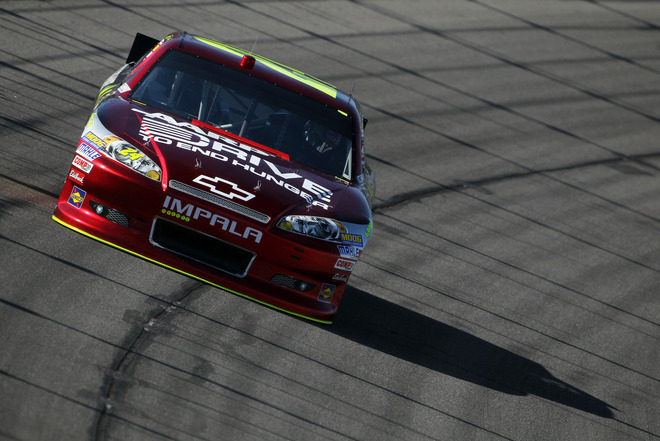 Ten laps later, he moved back into 7th by passing Aric Almirola, and then took 6th from Brian Vickers. He re-entered the top-5 on lap 40 by passing Brad Keselowski. A debris caution on lap 70 brought the leaders to pit road. Gordon opted for 2 tires and restarted in 4th place. Shortly after the restart, Gordon and Jamie McMurray made contact, with Gordon brushing the turn 4 wall. 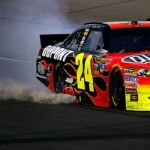 He dropped to 19th before a multi-car wreck that involved Jimmie Johnson, Greg Biffle, Josh Wise, and Justin Allgaier. Gordon came to pit road to check the sheet metal and restarted in 22nd place on lap 91. 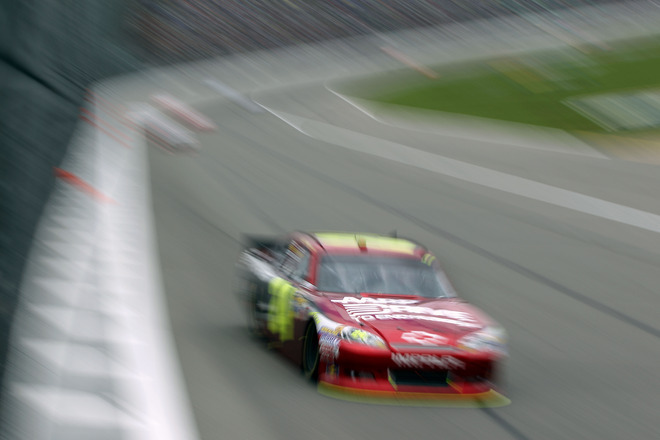 At the 100-lap mark, Gordon ran in 20th place. 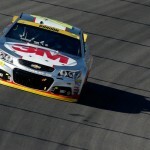 He steadily worked through race traffic and ran in 16th place on lap 120. A caution for Dale Earnhardt Jr’s cut tire and subsequent wall contact on lap 123 brought the leaders to pit road. A tire rolled across pit road during the stop and Gordon had to drop to the tail end of the line for the restart. He moved from 22nd to 16th by lap 160. A caution for Keselowski’s cut tire and wall contact brought the caution on lap 161. Gordon worked through traffic and advanced to 12th on lap 175. He took 11th from Austin Dillon and re-entered the top-10 with a move around Denny Hamlin on lap 180. Gordon moved to 9th prior to a caution for Joey Gase’s crash on lap 189. Pit stops followed with Gordon restarting 10th on lap 196. With 60 to go, Gordon ran in 9th place. He moved to 7th with 52 to go when Kevin Harvick came to pit road with a tire issue. 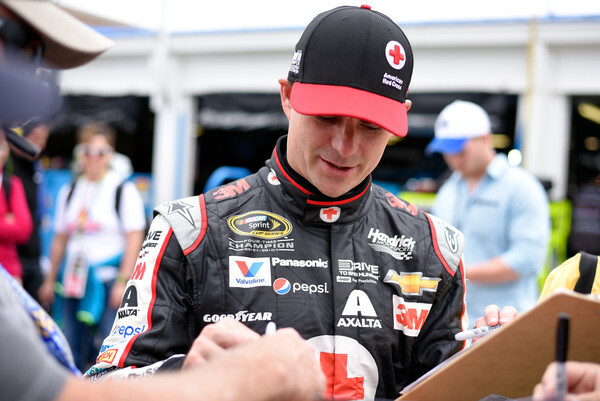 Gordon took 6th when Kasey Kahne pitted on lap 227. One lap later, Greg Biffle cut a tire and hit the wall to bring out a caution. Gordon came to pit road for four tires and restarted in 8th place with 35 to go. After Clint Bowyer got a run on the outside, Gordon battled handling issues and dropped back to 14th place before the next caution for Kasey Kahne’s wall contact with 32 to go. With 15 to go, Gordon ran in 15th place. He took 14th when Jamie McMurray came to pit road with a tire issue with 5 laps to go. 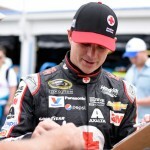 Contact with Jamie McMurray cost track position on lap 75. A tire got away on pit road on lap 125 dropped him outside the top-20. From there, it was an uphill battle for track position. 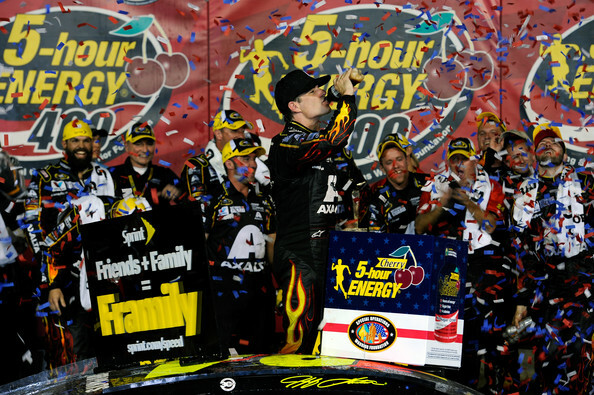 Jeff Gordon scored his 89th career win in the 5-Hour Energy 400 at Kansas Speedway. Gordon battled back from an ill-timed caution flag on lap 111 which put him deep in the field. 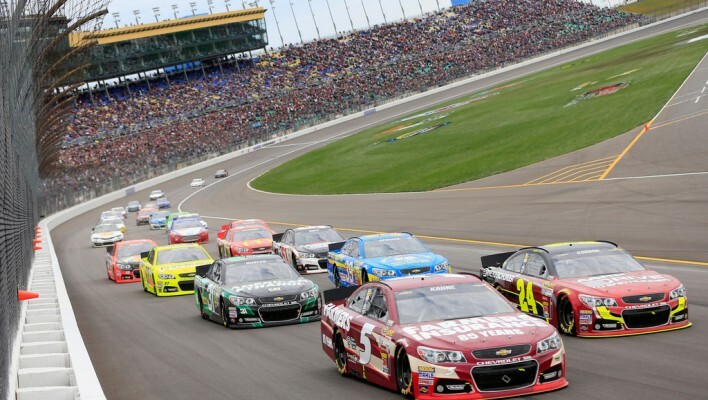 He moved ahead of Kevin Harvick after the final green flag pit stop sequence with 30 laps to go and edged Harvick by 0.11-seconds for the win. 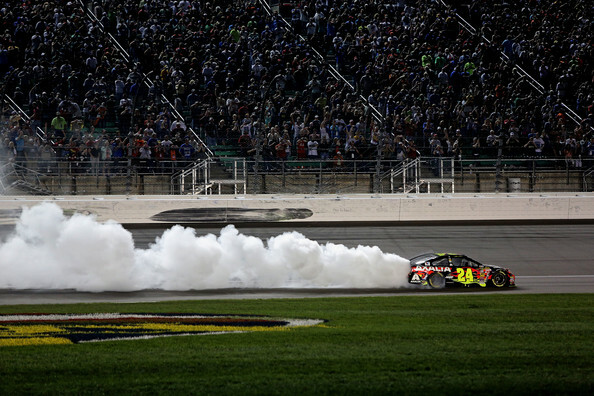 It was Gordon’s 3rd victory at Kansas, and he essentially clinched a spot in the 2014 Chase for the Championship. 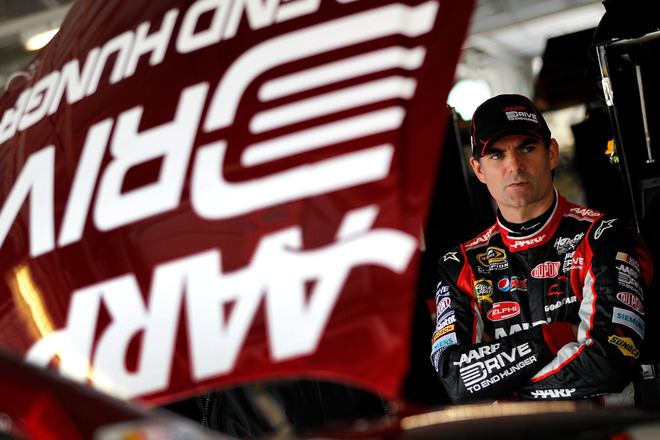 Gordon started 13th and moved into the top-10 within 8 laps. 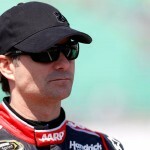 He advanced to 7th by lap 20 and took 6th from Kurt Busch on lap 23. 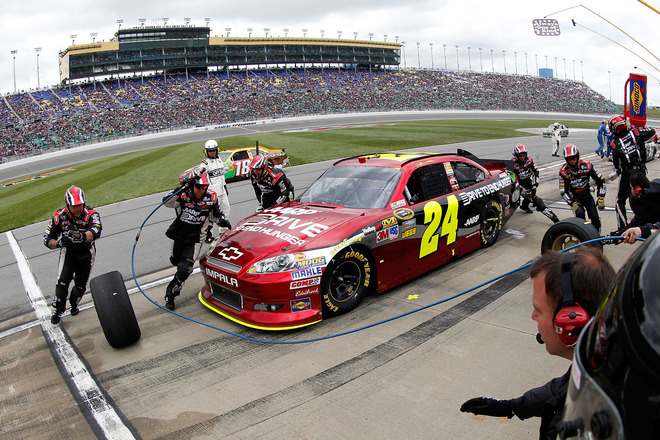 Gordon stayed out to lead a lap during a cycle of green flag pit stops on lap 44. Clint Bowyer’s spin brought out the first caution on lap 47. 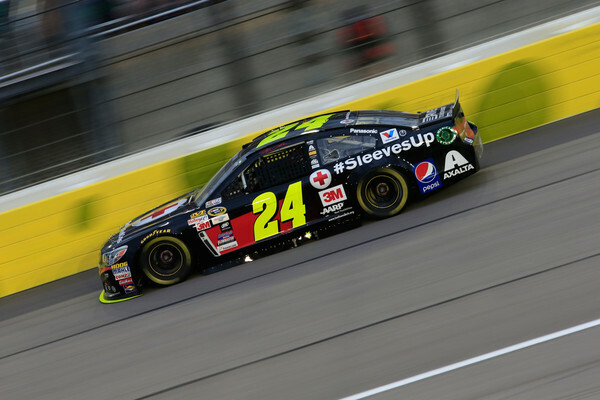 Gordon restarted in 6th place on lap 52. The second caution came on lap 60 for a multi-car crash involving David Ragan, Landon Cassill, Michael Annett, and Ryan Truex. Gordon stayed on the track and restarted in 5th on lap 65. He took 4th from Carl Edwards on lap 70 prior to the next caution for Denny Hamlin’s spin. 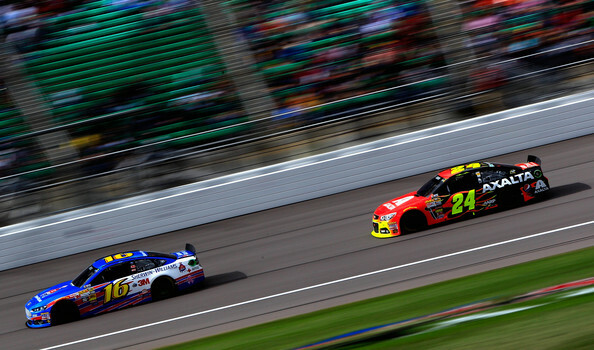 After the restart, Gordon tracked down race leader Kevin Harvick and moved to the runner-up spot. Gordon came to pit road for a green flag stop on lap 100. Marcos Ambrose’s spin on lap 111 brought the caution, which briefly trapped Gordon a lap down. He took the wave-around during the caution period to get back on the lead lap. 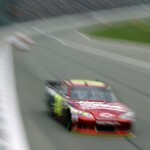 Gordon restarted in 18th place on lap 119. He struggled to make headway and ran 17th when the caution waved on lap 151 for Jamie McMurray’s crash. Gordon came to pit road for tires and restarted in 15th place. He quickly moved to 13th on lap 162 and took 11th from Brian Vickers on lap 170. Gordon re-entered the top-10 on lap 173 with a move around Ryan Newman. He ran 9th when the caution waved on lap 180 for Kurt Busch’s spin. Gordon opted for two tires and restarted in 8th place. The next caution came on lap 186 for a hard wreck involving David Gilliland and Justin Allgaier. The restart came on lap 194 with Gordon in 8th place. He immediately took 7th from Danica Patrick and passed Kasey Kahne for 6th on lap 198. Kurt Busch brought another caution with a spin on lap 202. Gordon stayed out and restarted in 5th place. 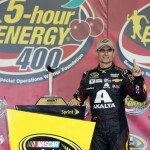 He took 4th from Kyle Busch with 59 to go and moved to 3rd around Dale Earnhardt Jr with 56 to go. 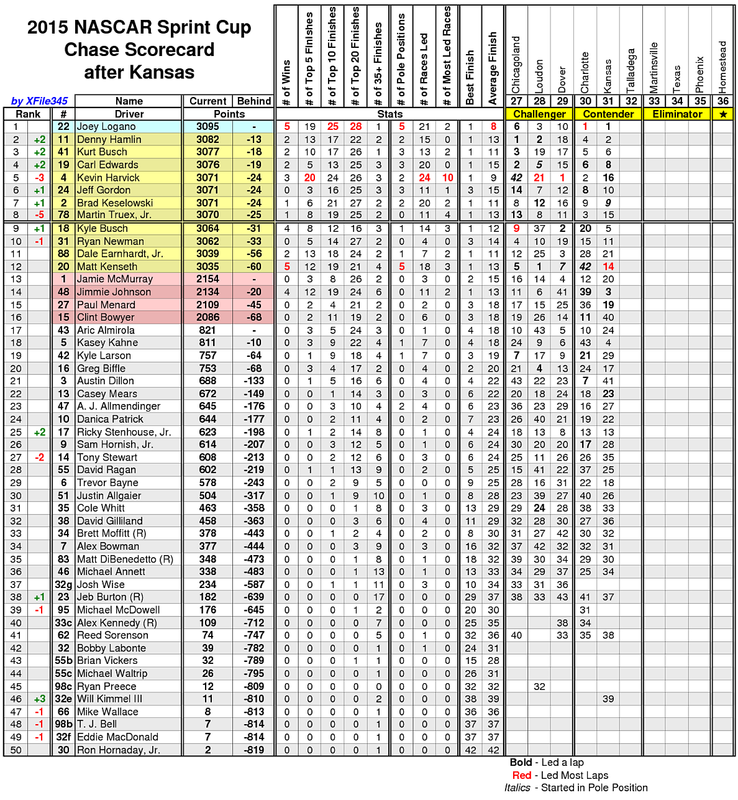 Gordon moved back into the runner-up spot with a move around Joey Logano with 48 to go. 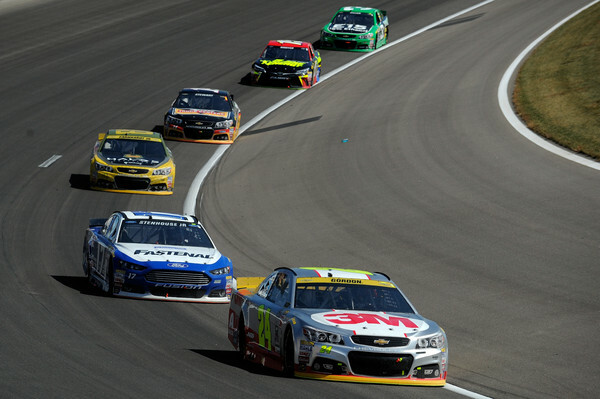 Gordon steadily closed in on Harvick for the race lead. 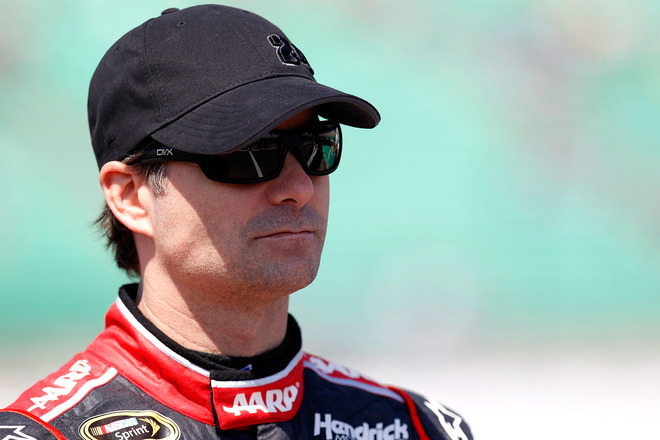 He chopped Harvick’s lead down to 1.5 seconds prior to a green flag pit stop with 30 laps to go. 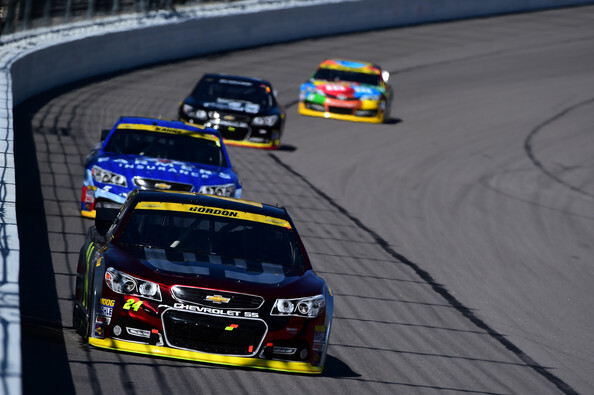 Following stops, Gordon moved ahead of Harvick and extended to more than 1-second in front. He re-assumed the race lead with 9 laps to go. Gordon came to pit road in 2nd place for the final green flag pit stops with 30 laps to go. 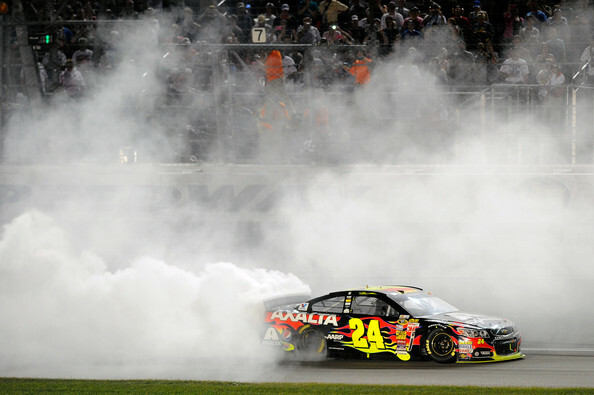 After the cycle of stops, Gordon had taken the race lead from Kevin Harvick who waited one lap later than Gordon to make his final stop. WHAT WAS THE KEY TO WINNING THIS RACE? 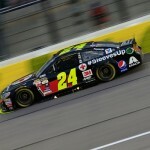 It wasn’t a long-awaited win for Jeff Gordon in the Hollywood Casino 400, but a solid 3rd place finish moved him to 4th in the NASCAR standings, just 32 points from the lead. 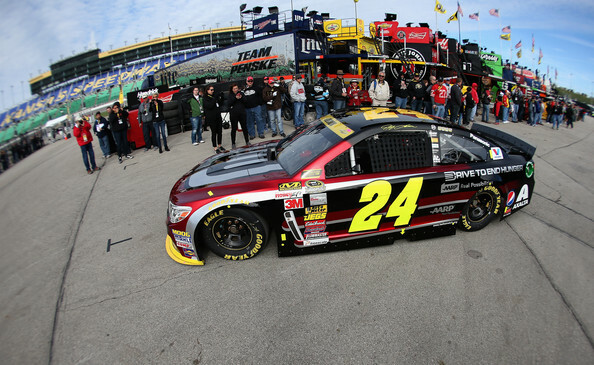 Gordon’s 429th career top-10 moved him past Dale Earnhardt for the 4th highest total in NASCAR history. Gordon started 14th and ran well ahead of a lap 1 crash involving Danica Patrick. 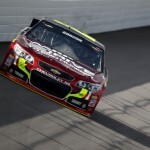 He advanced to 12th by lap 35 and ran 11th when the caution waved on lap 42 for Michael McDowell slowing on the track. Gordon opted for two tires on the pit stop and restarted in 4th place. 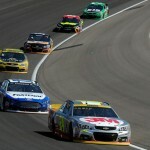 He used the outside line to take 3rd, but returned to 4th when Jimmie Johnson passed on lap 69. Gordon came to pit road for a stop on lap 85, just prior to a debris caution on lap 87. Although the caution trapped him a lap down, he stayed out for the wave around to get back on the lead lap. He restarted in 28th place on lap 92. 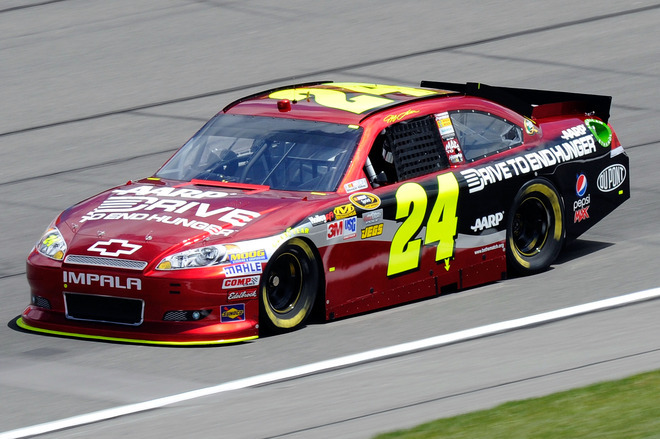 Gordon steadily gained spots and ran 21st at the 100-lap mark. Gordon had advanced to 18th before the caution waved on lap 118 for Landon Cassill’s engine. Pit stops followed with Gordon opting for two tires and restarting in 14th place. He ran 12th at the halfway mark just prior to a caution for a wreck involving Ryan Newman and Justin Allgaier. Pit stops followed with Gordon opting for two tires. 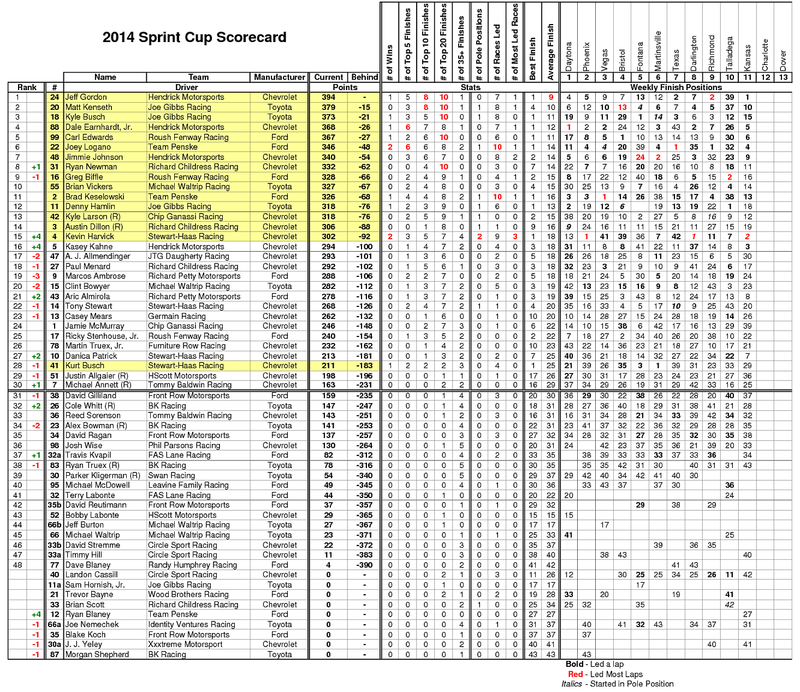 He restarted 11th on lap 144 and moved into the top-10 prior to the next caution for Travis Kvapil’s spin on lap 146. 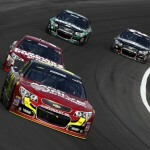 Gordon moved around Carl Edwards and Dale Earnhardt Jr on lap 152 to take 7th place. 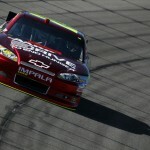 However, he battled a tight handling condition and dropped to 11th by lap 165. A caution for David Gilliland’s wreck with 97 to go brought Gordon to pit road for adjustments. He changed four tires and restarted in 19th place. Gordon gained 4 spots after the restart to run 15th, prior to a caution for Casey Mears’ wall contact on lap 180. Kyle Busch’s spin brought out another caution with Gordon moving up to 13th place. The next caution waved with 68 laps to go when Carl Edwards made contact with Busch, which sent him into the wall and destroyed the front of the M&M’s Toyota. Gordon came to pit road for four tires and restarted in 28th place. He came to top off the fuel with 61 laps to go. Gordon worked through race traffic and ran 18th with 50 laps to go. He moved up to 11th place prior to a debris caution with 40 to go. Gordon came to pit road for two tires and restarted in 3rd place because he didn’t have to wait on fuel as the other drivers did. 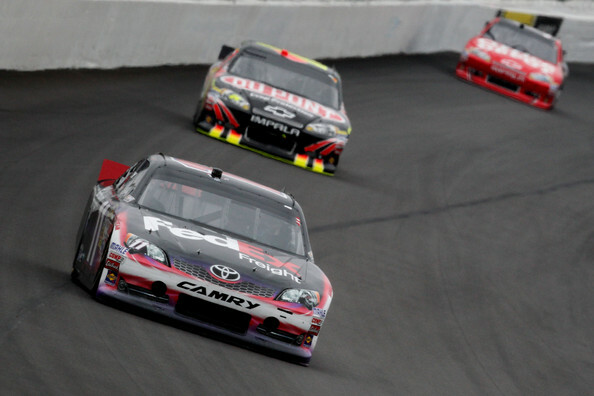 On the restart, Gordon moved around Jeff Burton to take the runner-up spot. He ran more than a second behind race leader Kevin Harvick before a caution for Brian Vickers’ crash slowed the field with 25 laps to go. He restarted on the inside of Harvick with 19 to go. Kurt Busch moved to the outside to pass Gordon in turn 1. 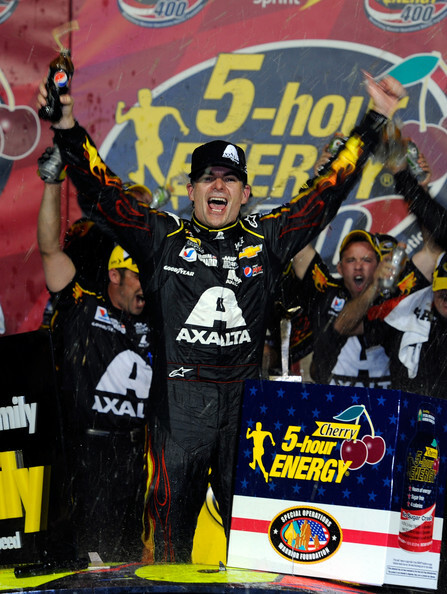 Gordon settled into 3rd place behind Busch where he finished the race. Topping off the fuel with 61 laps to go allowed Gordon to spend less time on pit road when he came in for the final with 40 laps to go. 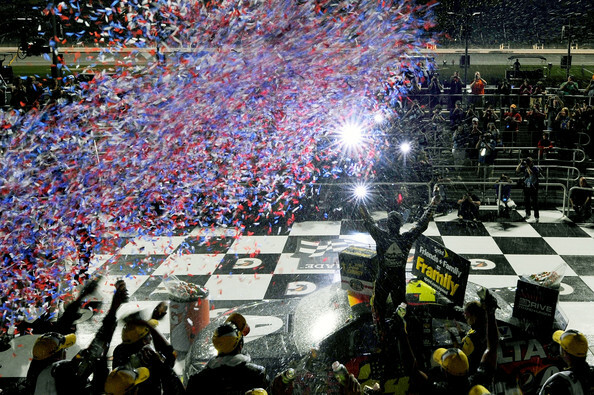 Matt Kenseth dominated the STP 400 at Kansas Speedway en route to his second victory of the 2013 season. Kenseth led 163 of the 267 laps in the event. 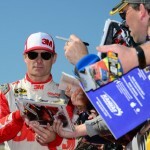 Jeff Gordon struggled with track position for the balance of the day and posted a 13th place finish after starting at the rear of the field. Gordon officially started 43rd, but moved to 39th at the drop of the green flag. He moved up to 38th by the first caution on lap 5 for Kyle Busch’s spin. Gordon stayed on the track and moved up to 32nd place after the restart. He ran 30th on lap 15 and advanced to 26th by lap 25. Gordon gained three more spots in the next 10 laps to move into 23rd place. The next caution waved on lap 38 for Dave Blaney’s wall contact. Following a pit stop, Gordon moved to 15th place. He ran 14th when a debris caution slowed the field on lap 72. Gordon opted for four tires and restarted in 18th place. He dropped out of the top-20 shortly after the restart. He regrouped and took 20th from Joey Logano on lap 82, and then moved into 18th place on lap 85 prior to a caution period for Elliott Sadler’s wreck. 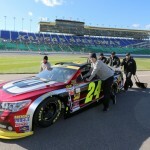 At the 100-lap mark, Gordon ran in 15th place, more than 10 seconds behind race leader Matt Kenseth. The next caution waved on lap 103 for Kyle Busch’s second spin of the day, which collected Joey Logano in a hard crash in turn 3. Gordon came to pit road for two tires and restarted 18th on lap 115. He dropped to 20th shortly after the restart, but moved around Aric Almirola and Brian Vickers to take 18th place on lap 122. At the halfway point, Gordon ran in 16th place. He came to pit road under green on lap 163 and returned in 21st place. The next caution waved on lap 172 for Vickers’ wall contact. Gordon stayed out and restarted in 7th place. He dropped to 10th prior to the next caution for a multi-car incident involving Sam Hornish, Marcos Ambrose, and Casey Mears. Gordon fell to 14th shortly after the restart on lap 186. He moved up to 13th on lap 190. Gordon came to pit road for a green flag stop on lap 217, just as the caution waved for debris on the track. Gordon was trapped a lap down but took the wave around to get back on the lead lap. He restarted 22nd on lap 224 and moved up to 19th with 40 laps to go. Ten laps later he moved into 16th place and closed on Jeff Burton for the top-15. 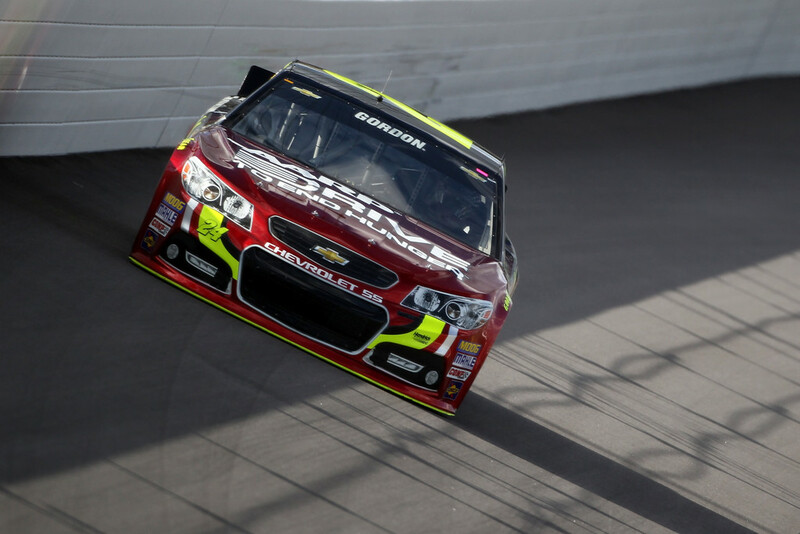 With 20 laps to go, Gordon closed on Kurt Busch for the 14th position. 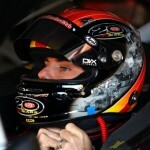 After passing Busch, he set his sights on Ryan Newman and took 13th place with 4 laps to go. Gordon was running 13th when he came to pit road on lap 217. However, an ill-timed caution flag put him a lap down and took him out of contention of a possible top-10 finish. 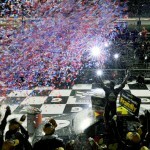 Matt Kenseth might be leaving Roush Racing at the end of the 2012 season, but he’s creating quite a final act with his second victory in the Chase. 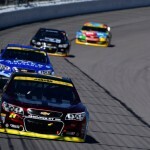 Kenseth scored the win at Kansas Speedway in an event that featured 14 caution flags because of the repaved track surface. 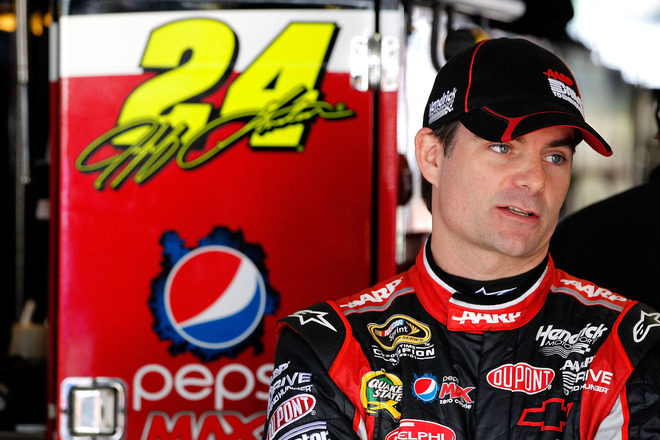 Jeff Gordon struggled with handling on the final run of the day and finished 10th. 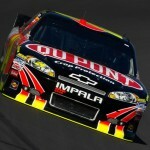 He trails points leader Brad Keselowski by 51 points with just 4 races to go. Gordon started 19th and moved up to 15th by the end of lap 5. He was running 14th when the first caution waved on lap 31 for Casey Mears’ wall contact. Gordon pitted for tires and restarted in 20th place. He moved to 17th but was unable to make significant headway before the next caution on lap 70 for AJ Allemdinger’s cut tire. Gordon opted for 2 tires and restarted in 7th place. He moved to 6th before a caution for Jeff Burton’s wall contact on lap 83. Gordon slipped to 9th after the restart, but eventually worked his way around Regan Smith to take 8th place on lap 110. Aric Almirola’s cut tire on lap 123 slowed the field. Gordon came in for tires and restarted in 4th place. Jimmie Johnson crashed on lap 136 to bring out the caution. Johnson got loose exiting turn 4 and backed the Lowes Chevrolet into the wall. Repairs were made on pit road which allowed Johnson to stay on the lead lap. 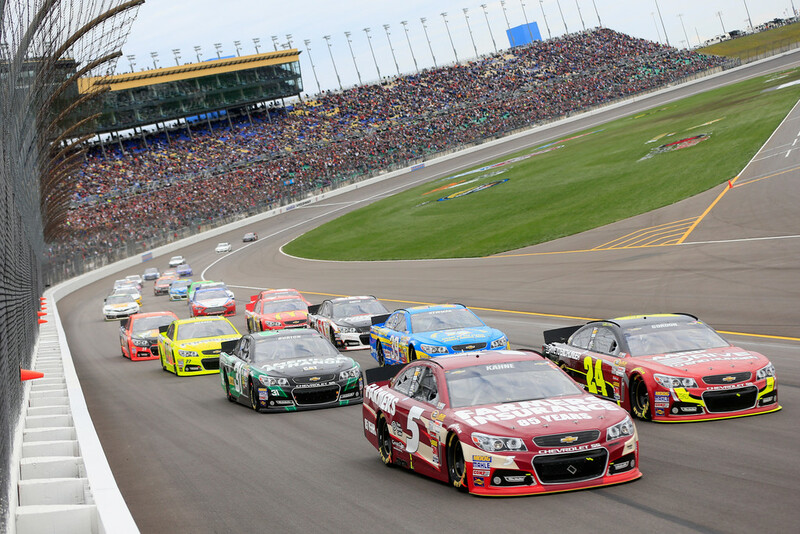 On the restart, Gordon moved to the runner-up position behind race leader Matt Kenseth. One lap later, Bobby Labonte’s wall contact slowed the field. Gordon dropped to 3rd on the restart before Danica Patrick’s crash brought out the caution on lap 156. He came to pit road for 2 tires and restarted 7th because of some drivers opting not to pit. 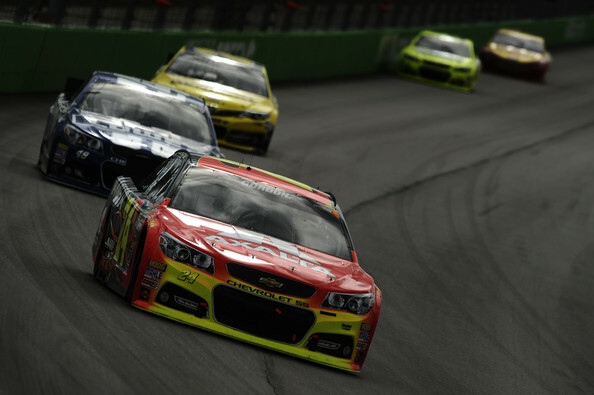 Gordon dropped to 9th before a caution on lap 165 for Tony Stewart’s spin. 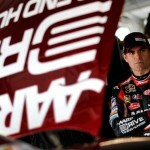 A caution for Greg Biffle’s crash with 92 to go slowed the field with Gordon in 10th place. With 85 to go, Ryan Newman hit Kyle Busch and created a wreck in turn 4. With 54 laps to go, Almirola’s crash brought out the caution and the final round of pit stops ensued. Gordon restarted in 9th place after opting for 4 tires. He moved to 8th before a caution for Sam Hornish’s cut tire with 33 laps to go. 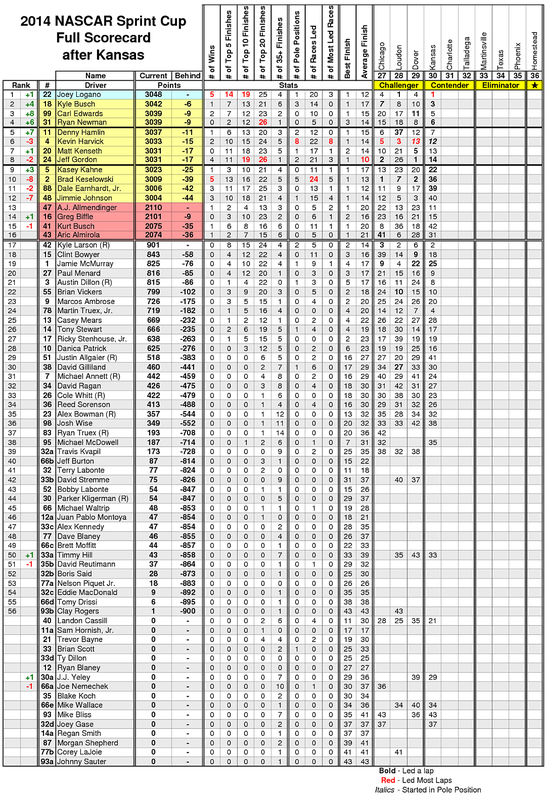 Gordon dropped to 9th with 14 to go when Brad Keselowski went by. Two laps later Johnson went by Gordon to drop him to 10th place where he finished the event. 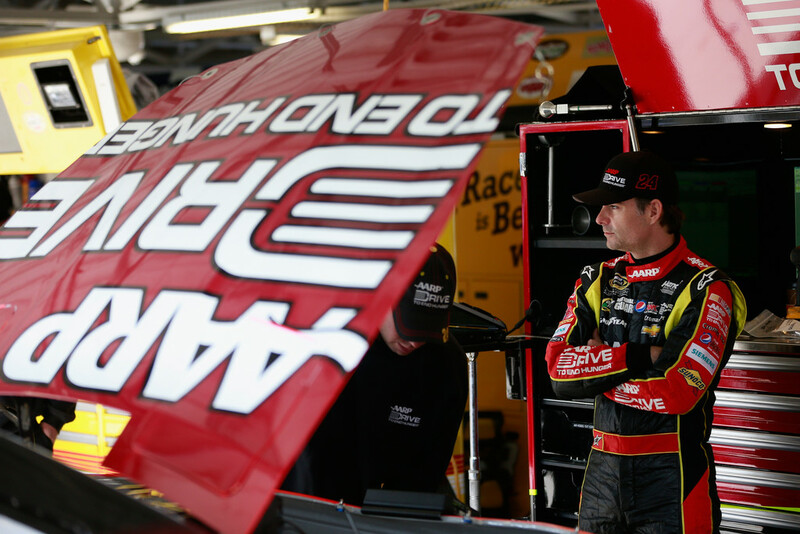 It was Gordon’s 7th top-10 in the last 9 races. 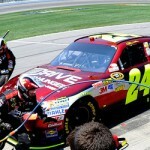 A four-tire change during the final round of pit stops didn’t work out to Gordon’s advantage. He battled handling issues in the late stages of the event and dropped to 10th place. 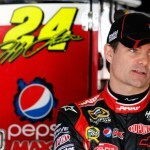 Another dose of bad luck bit Jeff Gordon at Kansas Speedway. 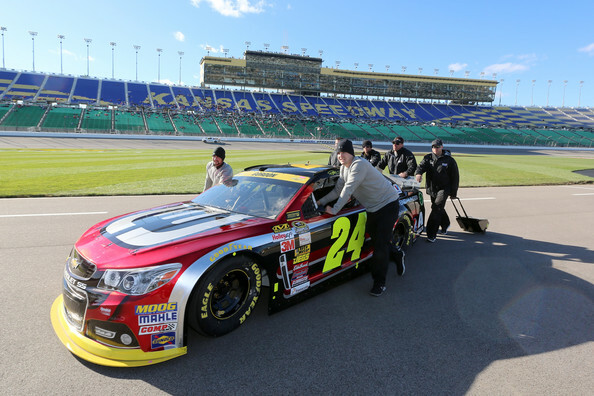 For the second consecutive race at Kansas, Gordon experienced late-race engine issues resulting in a sub-par finish. Gordon started 20th and gained four spots in the opening 10 laps. He ran 12th on lap 35 before coming to pit road for a green flag stop on lap 46. Over the next 80 laps, Gordon ran 12th-13th while battling handling issues. A caution flag on lap 142 brought the lead lap cars to pit road. Gordon failed to move foward and was mired in 15th. A caution on lap 187 for Juan Pablo Montoya’s wall contact brought pit stops. Gordon restarted 17th and moved to 12th with 70 laps to go. 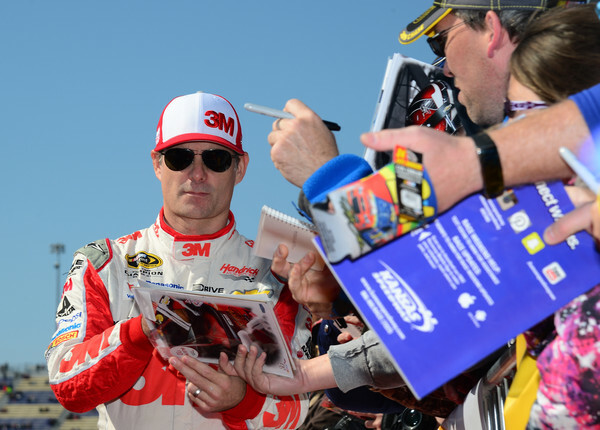 He entered the top-10 with 60 to go and took 9th from Kevin Harvick four laps later. Gordon came to pit road for a green flag stop with 44 to go. While running 9th with 35 to go, Gordon dropped a cylinder. He struggled to maintain minimum speed and came to pit road. He finished the race in 21st place, three laps down. 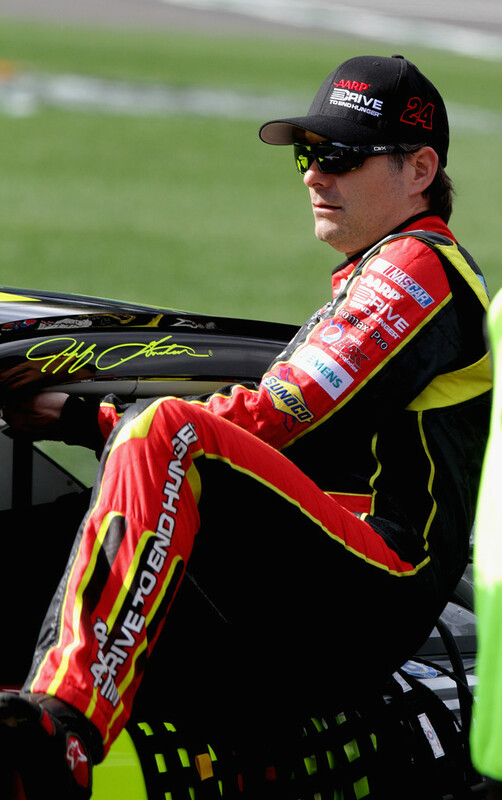 Gordon dropped from 17th to 18th in the series standings. It was his 5th finish of 21st or worse in the last 10 races. Gordon was running 9th when he dropped a cylinder with 35 laps to go. Although Gordon was not in contention to win the race, he seemed primed to pick up career top-10 #399 before the engine issues. 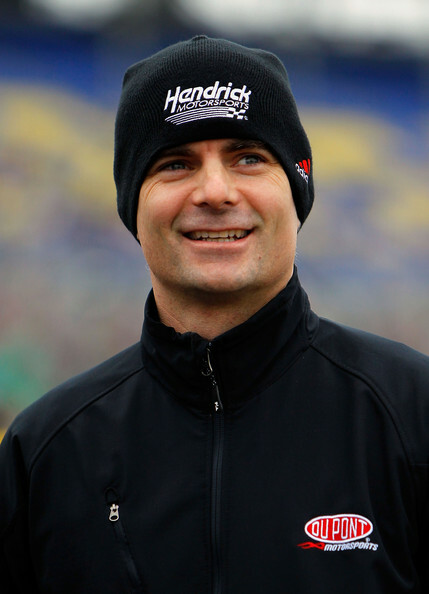 In the span of 30 laps, Jeff Gordon’s season effectively came crumbling apart due to a blown engine. 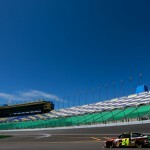 Gordon ran in the top-5 for most of the event at Kansas Speedway, but was shuffled to 14th on a late race restart. He began smelling smoke in the car and pulled to pit road with a blown engine 30 laps later. 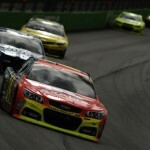 Gordon dropped to 10th in the standings and trails by 47 points with just 6 races remaining. 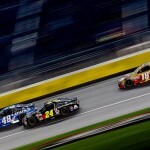 Road Ahead: Saturday night at Charlotte Motor Speedway looms on the calendar. 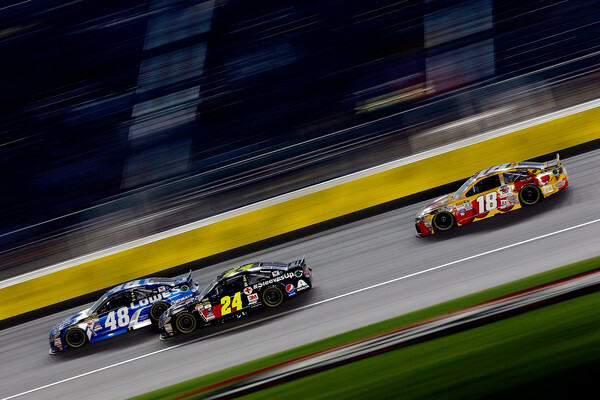 Gordon has struggled at Charlotte in recent years, but the team has turned a corner on its intermediate track program and seemed poised for a strong effort. 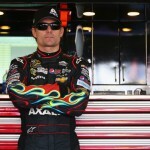 Jeff Gordon knew his car was better than his 22nd place starting spot at Kansas Speedway. He turned the 2nd fastest lap in the final practice session a day earlier and fought a loose handling car during the qualifying run. 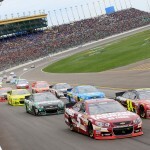 When the green flag waved to start the STP 400, Gordon moved through race traffic. 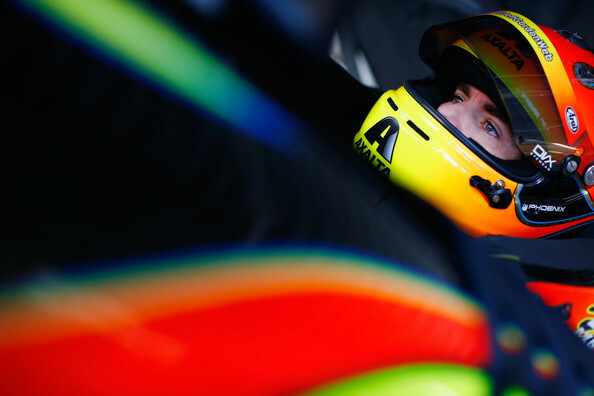 By lap 15, he had gained seven positions on the track. On lap 30, he entered the top-10 with a pass on Brian Vickers. 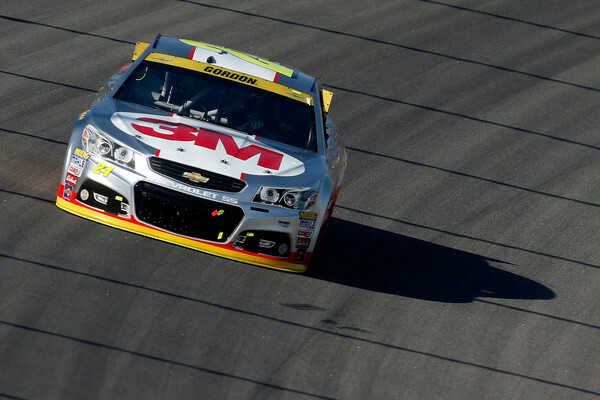 After a cycle of green flag pit stops, Gordon ran in 9th place. He had moved to 8th when the first caution for debris waved on lap 67. 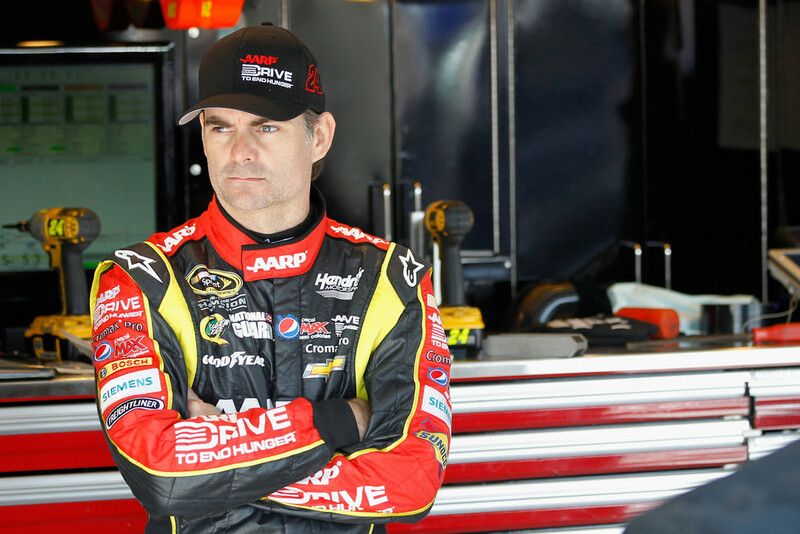 Gordon ran as high as 6th before handling issues on a longer run allowed Kevin Harvick to pass on lap 95. Following a caution flag and pit stop, Gordon zoomed through traffic on four fresh tires. He moved up to 4th on lap 118 before Landon Cassill brought out the caution one lap later. At the halfway point, Gordon ran in 3rd place. However, he lost two spots on pit road during caution flag stops on lap 160. Gordon moved to 2nd on lap 165 when Tony Stewart and Denny Hamlin made slight contact in turn one. With 62 to go, Gordon pitted for tires and fuel under the green flag. He ran in 2nd until he came to pit road for fuel with 19 laps to go. 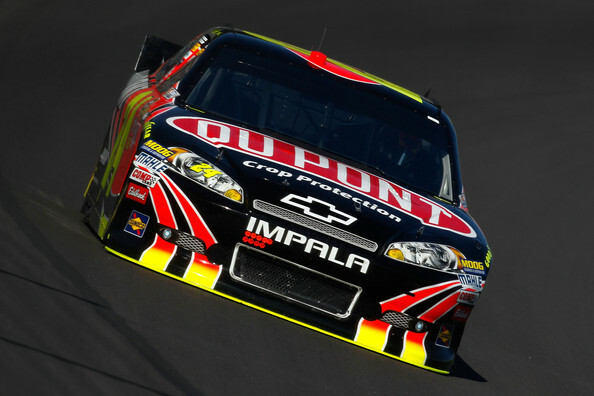 Gordon finished the race in 4th due to the top-3 winning the fuel mileage game. 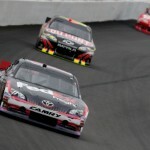 Road ahead: The NASCAR series visits Pocono Raceway for the first of two visits in 2011. 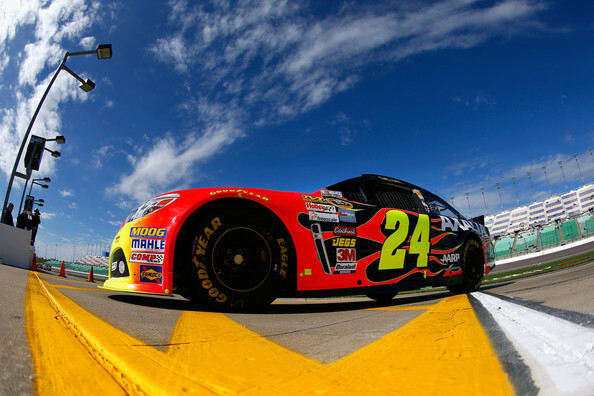 Gordon has 7 top-10 finishes in the last 9 races on the 2.5-mile triangular track. 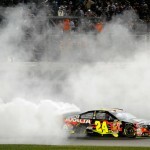 He has 4 career wins at the track, with the most recent coming in a rain-shortened event in 2007.